Plan ahead: Try to foresee not only where a falling block will land, but also what will happen once that block breaks up later in the game. As an example, when the 3 lands on the 7 in the situation depicted in the figure on the right, the blocks will break up, and the 8 at the right will fall on the 2, building an additional sum. But this is not all: the 8 that will become loose in the fallling block will combine with the 2 horizontally to build an additional sum, and the same will happen between a 6 and a 4. Landing that falling block with the 3 on top of the 7 will lead to a quite extensive chain reaction! Use horizontal matching: You can attack a tall pile of numbers at its foundations by building sums horizontally near its base (unless you switched off “horizontal matching”). Look at the figure on the right. 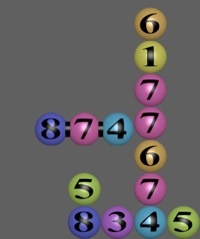 Once the falling block lands, there will be an horizontal sum to 10 between the 4 and the 6, which will blow a hole near the bottom of that tall column of numbers, which will then become shorter. 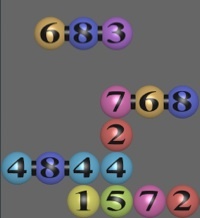 Use more than two numbers: Try to put small numbers together, so that when you build a sum you get rid of more balls. Operation: The game can be adapted to smaller children by choosing a sum to a number smaller than 10, or using less digits. Maybe you can keep summing to 10, but only use the digits from 1 to 5. Or else you can try using only the digits from 1 to 3 and summing to 6. The possibilities are endless... but beware: some of them will be impossible, others too easy! Gameplay: Silence the sound effects, change the speed of the falling blocks, or start using the accelerometer to move the falling blocks left or right. 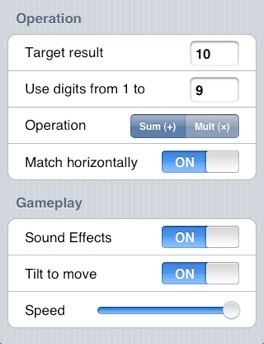 Switch on "tilt to move" to shift the falling block by tilting your device. Note that you will need to experiment a bit at first, and learn how the device responds. It may take some practice to achieve optimum control. Pause (or stop) the game by clicking the “x” in the top-left corner of the screen. Swipe down to get a falling block to drop very fast (version 1.1 and above). iPad: Use the “+” button in the toolbar to switch the game between a “big” and a “small” theme, with the latter much more challenging.